Each year, a new set of designer bags arrives on the fashion scene. From fresh takes on heritage bags to brand-new silhouettes that are about to take the street style scene by storm, we’re already seeing some of the newest designs landing at retailers. Which of these designer handbag trends are worth the investment, though? To find out, I asked some of the most stylish fashion insiders to weigh in on the bags they will be buying in 2019. Their stylish selects are sure to inspire what you add to your shopping cart. From an updated take on one of Fendi’s most iconic designs to the new Celine bag we’re about to see everywhere to expertly sourced vintage Chanel styles, these are the designer bags fashion girls are investing in for 2019. Shop their picks ahead, and scroll down to see what landed on this editor’s list. "I really wanna get the Prada Sidonie. I think it's so iconic and love the shape." "I'm loving the Fendi Baguette bag right now because it reminds me of a classic '90s updated look, and it's the perfect size for my portable phone charger. (I always base which bags I buy on that.) I really love it with the muted logo as well!" This bag from Louis Vuitton is the next style I'll be investing in. The monogram finish is iconic, and I love the added detail of the delicate gold chain strap. "This season, I think I am going to buy the Margiela Glam Slam bag. I fell in love the first time I saw it, and when that happens, I definitely need to splash the cash! It is so different design-wise, practical, and will make the most basic outfit look much more edgy and cool." "I just bought the new Celine bag Sac Triomphe. It’s timeless and modern at the same—and I love the original revisited logo." "The designer bag I'm buying this year is the Josh bag from Danse Lente. It's a relatively young brand which I've been low-key obsessed with. I have purchased two bags from them in the span of a year mostly because they are reasonably priced, have really interesting designs, and are not seen that much on the arms of every fashionista and their mama. There is also a possibility to personalize the bag at Danse Lente with fun, hand-painted artwork. I love the top handle and soft leather on it and the bold color combos offered." "I am always searching for colorful, funky vintage bags, and the Chanel ones are original yet timeless and still good investments, as they never go out of style. I am looking for tweed ones these days with original colors. The RealReal and 1stDibs are my go-to sites to shop cool secondhand designer bags." 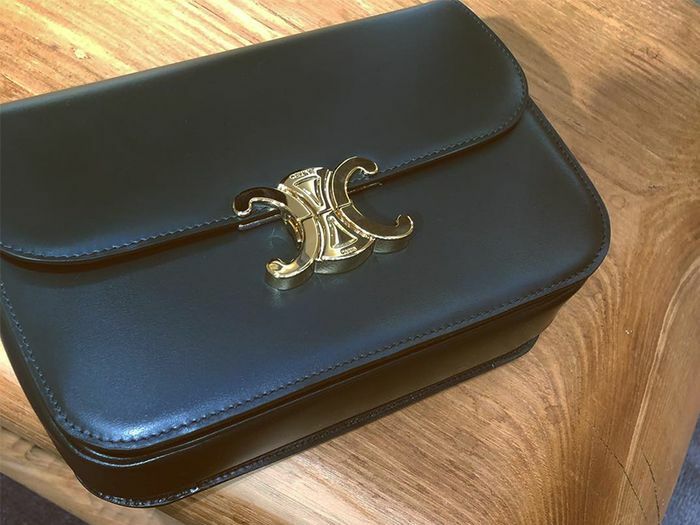 "Bottega Veneta is one of the most iconic and luxurious brands in the fashion industry and I am truly happy to see that they did an amazing job with their SS19 accessories – especially The Pouch clutch, which is one of the It bags for this season. The leather is extremely soft and the pouch has the perfect shape and size to wear from day to eve. Every cool girl will have it and we will see this style everywhere over summer I believe. Bottega is such a heritage label and one simply keep such items forever, so I am sure they will stay around for the next years." "I recently bought this L'Afshar bag because, simply put, I'm a sucker for a chain-link strap. The fact that it can double as a clutch and that the strap is removable (so I can attach it to others as well) are just bonuses." "Currently carrying Staud's Bissett Bag in this beautiful green croco. I'm obsessed with the simple silhouette; the absence of flaps, zippers, or closures of any kind; and no visible label. It's like a classic Hermès item with a millennial price tag." "I fell in love with Givenchy's GV3 handbag the moment I saw it. The fact that it's elegant, practical, and a bit edgy all at the same time is reason enough for me to invest, but then Bergdorf Goodman received this beautiful leather-and-leopard version with gold hardware, and I had to have it in my wardrobe immediately."